On this date in history, October 4, 1537, the first complete English-language Bible was printed, with translations by William Tyndale and Miles Coverdale. Inspired by a copy of Martin Luther’s German Bible, Tyndale began translating the New Testament into English about 1522 using the Greek text compiled by Erasmus, which was older than the Latin Vulgate. When Tyndale’s intention was made known to the Bishop of London, he was officially denied permission, so under the threat of being labeled a heretic, he was forced to flee England, but persisted in his efforts. A partial edition was printed in Cologne around 1525. But when he was “betrayed to the authorities (he) was forced to flee to Worms.” There the first edition of the New Testament was published in 1526. Tyndale’s translation was condemned and banned in England. Copies were seized and burned. In 1536 he was captured by officials. Defrocked in a public ceremony. Then turned over to civil authorities, tried and convicted of treason. While tied to the stake he was strangled, then his body was burned. His works were taken by others, additional Old Testament books were translated that would give rise to the Matthew Bible published on October 4, 1537, almost a year to the day Tyndale was martyred. Tyndale’s dedication and determination inspired others to continue translating the ancient manuscripts into English and other languages. In 1611 the King James translators drew significantly from Tyndale’s work when they produced their now famous English translation. Tyndale’s goal was for the common man to have access to the Scriptures and be able to read and understand them for himself. Today, Bibles in America are readily available at every bookstore. In hotel rooms. And it is accessible on the internet, iPhones and iPads. It’s really pretty amazing. Yet, we take it for granted. Men risked and gave their lives so we could read God’s Word. However, too often, our Bibles lay on the shelf and are never opened. It is easy to give lip service to the value of Bible study, yet quite another thing to commit ourselves on a regular basis to that noble task. It’s popular to read books about the Bible and the opinions of popular preachers. To listen to their interpretations. To sit in “study groups” and share personal stories and subjective ideas. Yet, fail to truly read for ourselves and “search the scriptures to (see) whether these things (are) so” (Ax 17:11). God’s Word will provide for us “all things that pertain to life and godliness” (2 Pet. 1:3). It is “profitable to doctrine, for reproof, for correction, for instruction in righteousness.” By observing its commands, and living by its directions we will be both competent and equipped to accomplish God’s purpose in our lives. However, we must read. Study. Examine. Meditate. And then have the will to apply it to our daily lives. (Eph 3:3-5; 2 Tim. 2:15). 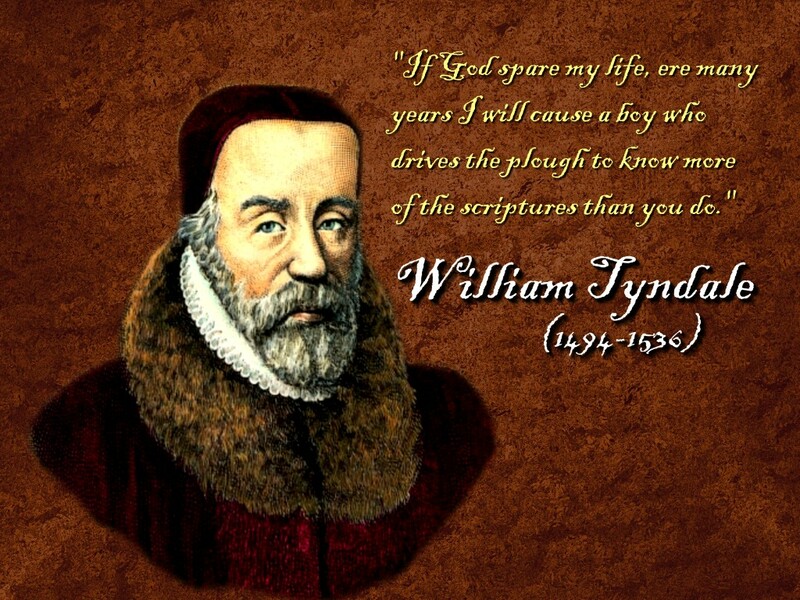 We owe a debt of gratitude to men like William Tyndale who sacrificed so much so we could have a copy of the Scriptures. Let us not take it for granted. Hey Brownie, thanks for sharing that fascinating encounter. Maybe sometime we can make that trip. Twice we have been robbed during our Zimbabwe trips. Both times my Bible, which was in a Bible bag, was stolen, probably because they thought something valuable was in the bag. It was valuable, but not the valuable they expected! The second stolen bible was a replacement of the first, and I had written this inside the bible, with my name. About 2 years after the 2nd Bible was stolen at the Botswana/Zimbabwe border (on the Zimbabwe side) I received a facebook message from a man in Zimbabwe asking if I was the owner of a bible and he quoted what I had written by my name. His mother had found this bible during a visit to Botswana, brought it back to Zimbabwe and asked her son if he could find the owner of the Bible! I offered the Bible to him, having long since replaced it. His reply has stayed with me. He could keep something something so precious. He was right. It is precious, but how easy it is to take for granted when I have the means and so many places to replace a stolen bible..
A Zimbabwe friend picked up the bible and is using it. Now I buy a bible to take on our Zimbabwe trips and leave it behind with someone.